We had so much fun with the 2009 Block of the Month (BOM) by Thangles that we’ve decided to do it again this year! Times two! Starting in October 2010 we’ll have the 2010 BOM by Thangles as well as a quilt pattern for more experienced sewers called ‘Beige Behemoth’ by Julie Owens of Big Horn Quilts. Okay, I have to admit I haven’t finished either sample yet but it’s sure been a busy summer (you can tell by how infrequently I’ve been updating this blog — very busy means no updates!). The Thangles BOM’s patterns are released month by month and cost $1.00 (plus sales tax) for the pattern AND fabric. This year I’m using beautiful batik sprays for the fabrics. You need to be local to the Puget Sound area to pick these up each month here at the studio; their exclusive BOM is not offered via mail or online. This is a great pattern for beginners and a fabulous way to get your feet wet with Thangles if you haven’t tried them before. I use them all the time for my middle-school students and in almost all of my projects. 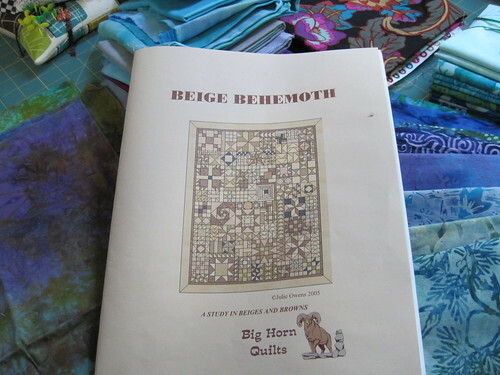 Here’s a link to the pattern at her Big Horn Quilts on-line shop: Beige Behemoth. Julie is a former engineer — like me — and I just think her pattern is pure genius. All 12 months of the BOM are included in the one pattern so at $14.00 it’s a total deal. The twin-sized quilt as shown is 70″ by 90″ but you can easily enlarge it to queen size 96″ by 96″ if you want a bigger quilt. She suggests starting with 10 fat quarters — in the same color family if you’re doing a monochromatic version — with an assortment of light, mediums, and darks. The twin size as shown takes about 30 fat quarters in total; the larger queen-size will take about 40 fat quarters. I asked Julie for permission to blog about my adventures making up her pattern and she graciously agreed, provided I did not include any sizing details. I’ve started a photostream on flickr that documents the steps I’m going through for each block, which you can get to by clicking on the picture above. Remember that I won’t include any of the sizes in the descriptions, so if you would like to sew this quilt and join us in the quilt-along, you need to buy the pattern for the specific details, and reward the designer for her hard work. Also because I’m a Thangles and other gadgets geek I’m not always completing the blocks according to her directions, but I wind up with the same results. If you have any questions about what I’ve done just e-mail me. The Behemoth has large blocks made up of several smaller component blocks. Each month I’ll post a photo with a link to the flickr photostream with that month’s blocks. If you’d like me to include pics of your blocks, too, just send them to me in e-mail and I’ll post those too. It will be fun to see how all the different colors develop! During the course of the Behemoth I’ll be using 2″, 3″, 4″ and 6″ finished Thangles. I’ll also be using the Lazy Girls Flying Goose X4 ruler, the Lazy Angle ruler, the Square in Square ruler, and a few rulers I’ve had custom cut for me. I’ll also be using standard rulers 6″ by 24″ , 6.5″ by 24″, 6.5″ by 13″, and 2.5″, 3.5″, 4.5″, 5.5″ and 6.5″ squares. If you’re local to the Puget Sound area, I have several copies of the pattern on hand, just e-mail me. If you want the 4 sizes of Thangles to go with the pattern, I’ll toss in one pack for free. If you want any of the rulers I’ve used and can’t find them at your local store let me know and I’ll see what I can bring in for you. Remember that I’m the ‘gadget’ librarian for the Kitsap Quilters Guild, which most months meets on the fourth Tuesday of the month in Poulsbo. We have most of these rulers in the library if you’re a member and would like to check them out. I’ve updated the gadget library page on the blog here, so now it reflects the guild’s holdings. Also I’ll be adding pages for basic quilt units construction, so be sure to check for new pages, especially if you’re unsure about how to sew a particular component. There will also be a page here for each BOM. If you’re local to the Puget Sound area and want to come and sew here in the studio, check the BOM page for open studio sewing dates.